Sifting through thrifted thoughts, she was a victim of a stick-up. Gun drawn, hair-trigger, staring down the sights, lining up memories. On sheets of quote-on-quote linen he was a visitor, a native of a distant land. From the hallway notes on a piano assembled into a chord and slowly spilled into the room. Often she would wish she was deaf, and that intimacy was primal based on quivering eye contact and a series of mapped stage cues that could be found on the inside of lampshades and on the undecorated backsides of wallpaper. It was high-time to adjust. Many adjunct professors, serving terms in the interim. She had to learn the swamp or become a reptile, one of which was an easy out. but that she was more like the words left unsaid. The sound of the piano lifted them towards the living room. There, in front of the sheet music sat her eight-year-old self, carefully pressing on keys. They walked over to the piano bench and each sat down. He walked to the next room and vanished into the ceiling tiles. She started to wear black to sink into the shadows. The outsides of her eyelids were adorned with coal. There were drives to the city where large groups of men would dance for her synchronized to the sounds of stoplights changing colors. She was not interested in those choreographed, but in the choreographer. In all her trips she could not break through the steady consistency of a well put together metronome. She said to the faceless men at bars. Her hand would survey the landscape of where eyes, nose, mouth, should be, only to caress the familiar feeling of smooth sanded wood. The contours of her hips stretched for miles when laid down in a single line. Years passed. One night, while sleeping, a knock came from her bedroom door. He was back, the one from before, filled with regret. He told her how he had planted rose seeds in her stomach, and had waited months for them to grow. He had grown impatient, he told her. The world was blue, their skin painted indigo, the moments before morning when the great lens of the ozone layer would hint of daylight. She told him about the faceless men; the amputees; the men all synchronized into patterns. He laughed, and then talked about the war for a short time. As the clock struck six, she saw that he had a broken nose. He held her close to him, and closed his eyes. The clock struck seven, and she noticed the scars on his forearms. Raising each one in her hands, she asked, “what did you do to yourself? The light revealed broken blood vessels which resembled road maps under his eyes, and his deformed right hand. He had tried to bash his own skull in. He wanted out of just a few senses. There was just too much in the world to experience it all. His hand was deformed from the beatings, the numbing, the nullifications. But he had missed the feeling of a warm body. He had paid to get a part of his brain removed, the vital piece responsible for desire of what makes life seem real. When music played, he thought of numbers and economic growth. In the morning light he wanted to be loved. She shot him once, twice, three times, and dropped the six-shooter. Blood spilled from his chest. A severed stem poked through the hole where one bullet had entered. She reached forth and drew a flower from a lavender plant which had been lodged in his chest cavity. Her chest was filled with forget-me-nots, and as she drove into the city she wondered why he had chosen lavender. Upon returning home, she heard familiar piano music. She walked into the living room to see her eight-year-old self practicing. The little girl finished and ran from the piano bench into the backyard. She followed her, and walked into the day of her mother’s second wedding. Her father had died in a nameless war, leaving her and her mother alone in this life. The man she was marrying that day was handsome; had a job with the government. After years of darkness, her mother had finally found someone. He would later go on to carry an alcohol dependency and beat her mother and beat his face in. But, in that moment, while her mother wore flowing white dress, she saw her mother the happiest she had been in a lifetime. They were standing on a patch of lavender. How had she forgotten? Had he followed her eight-year-old self to this moment after all those years? She walked to her room where his body had decomposed into a layer of soil on her sheets. In the sunlight, little greens had sprouted where he used to lay. That night, she slept on the floor beside her bed. This was a mistake that would not be repeated. What a spark in the dark life is; what infinitely faint chemiluminescence in an infinite dark expanse. She would learn to move past him, eventually. Days passed and the lavender continued to grow until the room was basked in its scent. Everywhere she went, her clothes smelled of him. She liked it, but it only made her think of him and reminded her she had killed him. She contemplated ripping the flowers out of her chest, so that this curse would never be passed on to anyone unlucky enough to love her with all of their might. She sat naked in her bathtub with her mother’s old letter opener. When the sharp edge pierced her skin, she noticed something: for the first time in months she could not smell lavender. Her clothes had been taken off and left beside the desk where her mother used to open envelopes addressed to her. She lifted herself out of the water, some of which clung to her soft skin. A drop of blood slipped from the wound on her chest and traveled down her abdomen. She walked past the room where he had taken his last breath, and continued down the hallway. Countless doors were left closed, and she explored the insides of the rooms she had never figured to discover. Some places, close to her bedroom, smelled of the flower, but she soon realized that there were plenty rooms of the house absent of the memory: her parent’s bedroom, father’s study, living room, kitchen. She walked outdoors, still naked, and looked to the treeline. 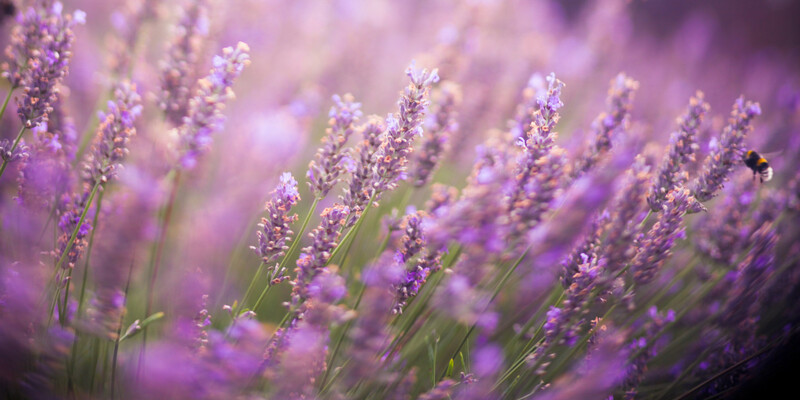 She displaced the lavender from her bedroom to the small garden outside, and smiled.